Modern technologies allow us to resurrect the deadliest predators of the past. Assemble the T-Rex robot and stop the invasion of your enemies. 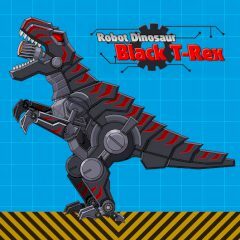 Even among the robots T-Rex takes place of the monster king, the most powerful and dangerous robot. If you want to stop the invasion, you must assemble the black one, that is far more powerful than any other made before. Spend your time at the factory and take control of it after.